1. What are some examples of cnidarians? In which environments can these animals be found? Jellyfish, Hydra, coral and sea anemones are good examples of cnidarians. All of them are aquatic and most of them live in the ocean. 2. What are the two main morphological patterns of cnidarians? Concerning locomotion, how are these forms different from each other? 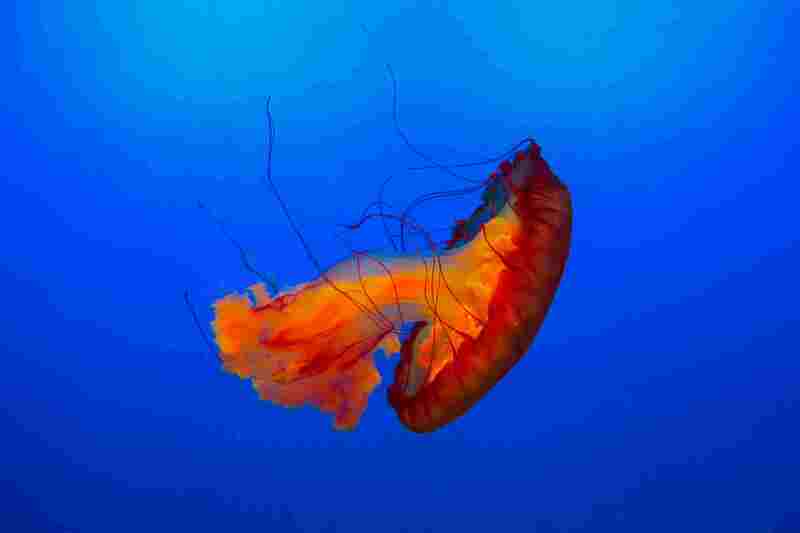 Morphologically, cnidarians are classified as polyps or medusae. Polyps are cylindrical and medusae are circular convex, like an umbrella. Both shapes have tentacles. In general, polyps are sessile although some species, such as Hydra, can move by alternating contact points on the substrate and performing somersaults. Medusae can move expelling water jets through contracting their bodies. Some cnidarians alternate between polypoid and medusoid forms during their life cycle. 3. Concerning tissue complexity, how different are cnidarians from poriferans? Cnidarians have true tissue differentiation, meaning that they present distinct, organized tissues in the body. Poriferans only present some specialized cells, with no tissue differentiation. 4. Which germ layers are present in cnidarians? Which tissues do they produce? Cnidarians have an ectoderm and endoderm, both of which are germ layers. Animals with only two germ layers are called diploblastic animals. The ectoderm produces the epidermis and the endoderm produces the covering of the digestive cavity. 5. Why is the digestive system of these animals considered incomplete? An incomplete digestive system is one in which the digestive cavity has only one opening. 6. What type of digestion occurs in cnidarians? Cnidarians have a digestive cavity and carry out extracellular and intracellular digestion. Extracellular digestion takes place within the digestive cavity. 7. What are cnidocytes? What is the name of the organelle inside cnidocytes? What are the biological functions of this structure? Cnidocytes are specialized cells present in coelenterates. They are found in the epidermis and contain toxic substances that can hurt, paralyze or even kill other animals. Each cnidocyte has an internal capsule know as a nematocyst, where the urticating substance is stored. When a cnidocyte is excited, it causes the nematocyst to expose a filament containing the toxic chemical. Cnidocytes and their nematocysts have the biological function of defending the organism from external aggression and helping to capture prey. 8. How is nervous tissue distributed in cnidarians? Their nervous system is diffuse, meaning that there is no brain or ganglia. 9. What types of reproduction are used in cnidarians? Cnidarians use asexual and sexual reproduction. 10. What type of asexual reproduction occurs in Hydra? Hydra reproduce asexually by budding. 11. What is metagenesis? What are the other names for this process? 12. In the metagenesis of Aurelia and Obelia, what form produces gametes? What form reproduces asexually? In the metagenesis of some coelenterates, such as Aurelia and Obelia, alternation between polypoid and medusoid forms take place. Polyps reproduce asexually, producing medusae that then release gametes. The male and female gametes unite under water to form the zygote that then develops into larva and later produces another polyp. The form that reproduces asexually is the polyp. Polyps produce medusae via budding in Obelia and via strobilation in Aurelia. 13. What is the name of the larva of coral and sea anemones? What is the biological importance of that larval stage? Sexual reproduction in coral and sea anemones goes through a larval stage. This larva is called planula. Many marine animals are sessile or practically sessile, including sponges, coral and sea anemones. The mobile larval stage of their life cycle provides better distribution of these species across spaces. 14. What are the main classes into which this phylum is divided? What are some examples of each and in which form (polyp or medusae) are they found? Coelenterates are divided into three main classes: hydrozoans, scyphozoans and anthozoans. In hydrozoans, the polyp form predominates. Examples of them are Hydra, Velella and Obelia. In scyphozoans, the main phase is the medusa form and the best known example is the common jellyfish (Aurelia). In anthozoans, only the polypoid form exists. Coral and sea anemones are notable members of this group. 15. What does radial symmetry mean? What type of symmetry is found in chordates? What other phyla of the animal kingdom contain species with radial symmetry? Radial symmetry means (biologically) that the animal structures are situated in a radial or circular pattern around a center point with the nonexistence of right or left sides. An alternative type of symmetry in which structures are placed equally along the sides of a longitudinal axis is lateral symmetry (the symmetry present in human beings, for example). Besides cnidarians, another animal phylum with species presenting secondary radial symmetry is the phylum Echinodermata. The simplicity of poriferans does not demonstrate any symmetry. Corals are characterized by their polypoid shape, sessility, slow growth and secretion of a solid skeleton made of calcium carbonate. Numerous coral specimens engage in harmonic intraspecific ecological interactions, forming colonies with hundreds, thousands and even millions of organisms. Water-permeated solid structures of these colonies, known as reefs, work as true ecosystems for other living organisms. The biggest known coral colony is the Great Barrier Reef on the northeast coast of Australia. However, there many coral species that live alone and do not form colonies. 17. The typical features of cnidarians. How are they characterized in terms of representative species, basic morphology, type of symmetry, germ layers and coelom, digestive system, respiratory system, circulatory system, excretory system, nervous system and types of reproduction? Examples of representative species: jellyfish, coral, sea anemones and hydra. Basic morphology: polyp or medusa. Type of symmetry: radial. Germ layers and coelom: diploblastic, acoelomates. Digestive system: incomplete. Respiratory system: nonexistent. Circulatory system: nonexistent. Excretory system: nonexistent. Nervous system: diffuse. Types of reproduction: asexual and sexual with a larval stage and metagenesis. Study the next subject: go to Flatworms.